Happy New Year: Bring on 2015! Happiest of New Years fellow shiny seekers! I welcome the onslaught that is 2015, and I look forward to experiencing all that it brings with you. That’s not to say anything cataclysmic is expected, but there are certain to be some highlights. The year is shaping up to have a whole slew of playable sandboxes to select from as well as some very delectable single-player titles. That’s right, you heard me: I’m finally talking single-player here. It’s going to be quite a year! 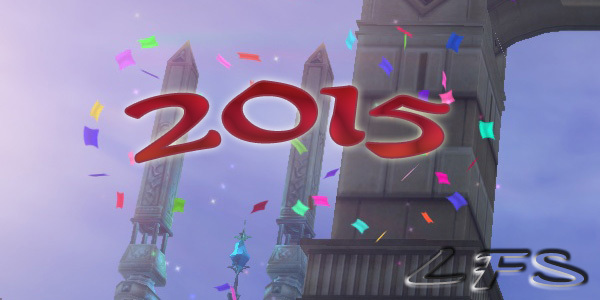 To help get the most of the next twelve months, I’ve made myself a set of gaming resolutions. 1. Streaming the single-player experience. You’ve asked for it, and you knew it was bound to happen sooner or later. It just so happens that 2015 is the year. Not only will I carve out time from my MMOs to dabble in this other genre but I will stream some of these experiences. Which title will be first? Hard to say; I have already bought a few in anticipation. When I first envisioned Looking For Shinies, I had planned on a podcast. Or something. I just haven’t quite settled on what it is I want to focus on. The fact is, I love doing voice work and I love communicating and interacting with you all. I find doing DJ work fun, and podcasts are certainly a way to express myself vocally… but I have even been entertaining doing some kind of old radio-type shows. In any case, the voice will be heard in 2015! As much as there are new games coming along that deserve some attention, there are some olda favorites who need more lovin’! I am particularly thinking about EverQuest II and all the beautiful glowy shinies it has strewn about so many lands. There is still so much to do there that I haven’t done; so much in fact that I practically sidestep it just so I don’t have to try and decide what to do first! I have plenty of unfinished collections, so there’s a place to start, no? No longer will I hide from my beloved shinies. Instead I will seek them out and spend quality time with them. And hug them, and squeeze them, and call them George. 4. Finish a build in Landmark. I keep getting distracted by touring, mining, and spelunking in Landmark so I have never once finished a build I have started! I’ve still had fun, but I do have some ideas I’d like to see through to fruition. Will it be a deathtrap cave with hidden treasure, or a maze with secret passages and puzzles? I don’t know — I just know I have to finish one. Just one! That will probably do me to start. I am sure new goals will present themselves over the course of 2015, and I can add them to the list. For now, I don’t want to overload myself. After all — I’ve got tons of games to play and only so much time! I don’t want to set myself up for failure because I was lost in a virtual world. Do you have any gaming resolutions this year? How about ideas for LFS? Share below! Great post I have a regrettable tecndney with EQ2 to bounce into the game for a few months, then bounce out again for a few, and repeat. I love the game, just love it there’s really no better game for me out there in terms of overall playability. And I think of so many things I haven’t done! I’ve never had a max level crafter (I don’t think I’ve ever hit level 50!) I only have one level 80 and one in the mid 70s, both scouts. There’s so many quests, and HQs, and full quest chains I haven’t explored. I guess when I re-join the game next I need to really attack those it’s so easy to change focus as you mentioned and switch from crafting to questing to messing around in your house I think what’s my excuse?